Now TV Friends iPhone version is available! Here’s release note of version 3.1.0 including TV Friends iPhone version. [iPhone] iPhone version is released. Features are same as Android version. From now on, the same feature as Android version will be released for iPhone version at the same timing. Sticker and Shop menus are deleted. Now you can access Help anytime even if you are on the Chat Room screen. Help is updated to match to the version 3.1.0. On Avatar Selection screen, the birth date field became optional. On Avatar Selection screen, gender field is moved to avatar image field. Added Black List and Grief Report features. By tapping a Ticker Comment or a Chat Comment, a dialog to add a user to your black list and to report the user to LUXALA will open. 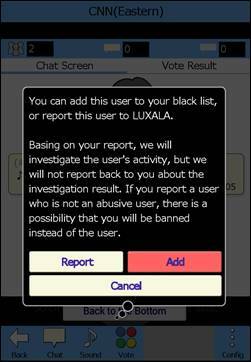 If you report a chat comment, it will be reported to LUXALA, and the report will be investigated. If you report a Twitter comment, it will be reported to Twitter. In Config menu, “Edit Black List” is added. 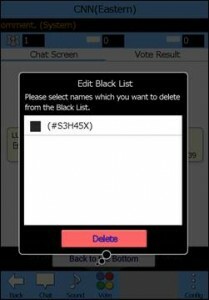 You can delete users from your Black List. In Config menu, “Contact Us” is added. You can report bugs from here. If you want to report abusive users, please use a Grief Report system rather than “Contact Us” as the system will collect evidences automatically. A bug that auto scrolling may stop is fixed. [Android] As the application may crash if the application loads and shows Twitter profile icon, the icon won’t be loaded and default Twitter logo will be shown until the crash will be fixed. About rating difference between iPhone and Android version. TV Friends is rated as +17 on iPhone, and 3+ on Android. This difference is caused by rating policy defference between Apple and Google company. On both platform, all aplication must answer questionaries (like “Does the application contain violent contents?”) to rate properly. As a result of answering the questionaries, TV Friends is rated as 4+ on iPhone and 3+ on Android. However, Apple reviews all applications before their release, and they required to rate TV Friends 17+ as it allows users post comments anonimously. Google’s questionaries excludes User Generated Contents, and TV Friends itself doesn’t contain any problematic contants, the application is rated 3+. To avoid lying to the questionaries, TV Friends remains as 3+ rating on Android platform. Please be noted that although ratings on 2 platforms are different as mentioned above, you must be 18 and older to use TV Friends as its End User License Agreement sayas.